A Stevie Dowds brace on helped Banbridge to victory over Cookstown, increasing their impressive lead atop the Ulster Premier League. Dowds dragged home a penalty corner ten minutes into the game before Dane Ward doubled the away advantage shortly after the break. To Cookstown’s credit they pressed for a way back into the game despite Banbridge controlling the majority of possession. Raymond Miller sparked life into Steelweld Park when he clawed one back with five minutes to go, converting a reverse deflection high into Gareth Lennox’s goal. Pressing for an equaliser, Banbridge broke against the outnumbered Town defence allowing Dowds to slap into an empty goal and seal a 3-1 win for the away side. “It’s always disappointing to lose to your rivals, but I’m pleased with the attitude of the squad tonight,” captain Greg Allen remarked after the game. 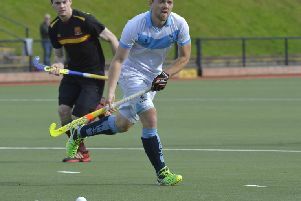 On Saturday Cookstown hosted UCC at Steelweld Park in the Irish Hockey League and came away victors 3-2. The Cork men stunned the Reds early, taking the lead after a rather complacent start from the home side. Cookstown were able to equalise midway through the second quarter when a Jon Ames deflection met a UCC body on the line, with the stroke netted calmly by Keith Black. Things then went from bad to worse for UCC as Andy Barbour tipped in a crash ball, giving Cookstown a 2-1 lead with 25 minutes to play. The Cork side were still reeling when the Reds bagged again, this time through Stuart Smyth who smashed a reverse stick shot in the bottom right hand corner. Seeking to increase their lead, the home side pressed in the fourth quarter, only for UCC to claw one back with a penalty corner. Cue a nail-biting close for Steelweld Park in a game which could have gone either way in the end. The Reds were able to hold out at 3-2 to secure their first IHL win this season and 4th place overall in their pool.